Air Elemental is a 1 Mana Cost Common Shaman Minion Elemental card from the Journey to Un'Goro set! Makes a mean puff pastry. Rating: 3.5/5. From 1018 votes. 1-drops are usually stronger than their cost would indicate, with up to 4 stat points and an effect on certain class cards (such as Voidwalker). The can’t be targeted keyword is worth 0 mana on smaller minions (see fairie dragon), and such this minion is a bit less mana efficient than the top 1-drops. In terms of playability, two things make this card much more viable than it would be. 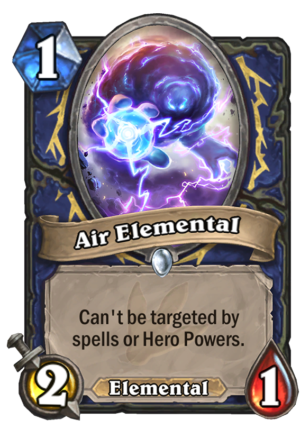 Firstly, it’s an elemental, which means in an Elemental Shaman deck it at least garantees synergies for the next turn (which slightly makes it a less horrible topdeck later on). Secondly and more importatly, Tunnel Trogg is out of standard, and while this isn’t that storgg, it could see some play in more agressive decks. The effect on a 2/1, however, is really wasted. Dagger is a hero Power ? I think people overrate this card. It just means mage cant ping it. 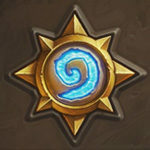 Weapons, or druid hero power still kills it. And would a priest really want to pain a 2-1? It still dies to a cleric. But i suppose it’s good for hunter quest.